The deed is dated March 23, 1852. It is done in the old cursive writing. Orla S. Lockwood sold the land to the town and school district #2 to erect a schoolhouse for the cost of $25.00. The size of the land is done in rods, but it is about three-quarters of an acre in size. Mildred Barber shared photos of events held at the school when her children went there. She also told me of the dances, bingo, and dinners held in the schoolhouse as well as town meetings and voting. She has been a resident in this town for over 65 years. In fact, we have a road named after her husband called Barber Road. All her children went to the schoolhouse. She explained the school was white when it was a school. The Ruel family is actually an heir of the Lockwood family which sold the land for the schoolhouse to be built in the current location. Glendo Ruel-Jimmo said her parents and brothers are buried in our St George graveyard. Her mother, Dorothy Chandler-Ruel, got the card tables. Some are still in the schoolhouse. She originally got a dozen tables so townspeople could play cards on them. She had to travel to Burlington to get these tables, and she got businesses to buy ad spaces that are on top of the tables. The ads paid for the cost of the tables. You can still see some of the names of the businesses on the tables as they are like lined with paper ads on top. Sidney Pike attended the schoolhouse from 1928 to 1934. In 1929-1930 the kitchen was added on. Before that, everyone brought bag lunches. In the winter the teacher, Ms. Wellinger, would bring in soup for the students to have for lunch. The boys would get paid $.25 a day for running the woodstove. At that time, the woodstove was over in the right hand corner of the room. Sidney’s father was on the school board and select board for the town at that time. He stated there were only 21 voters in the town. There was a piano in the room and also a library area. Betty Russell has photos of the school children in 1917 and 1919. One photo is of the children getting ready to march to the graveyard and change flags out around Memorial Day. When she went to the school it was white in color. They used to eat lunch under the crab apple tree and take home fallen apples for her mom to make jelly. She said even her mother went to that school. She was the only eighth grader to graduate from there when she went to school there. She graduated in 1947. The sinks in the bathroom came in after she finished school there. She explained how one part of the school with the double doors was used as the library and a place to hold plays. The room next to the kitchen was a wood shed for storing wood for the stove that used to be in the school. The boys were in charge of keeping the fire stocked and the wood stacked after it was delivered by someone in the town. There also used to be swing set. She thinks the desk that is still in the building looks like the original teacher’s desk from when she went there. Ms. Margaret Ham was the teacher when she was there. Ms. Ham’s mother would fill in from time to time. Later in the years, Betty’s three boys went to school there as well. Ginny Paquette attended the schoolhouse from 1948 to 1951. Back when she went to school, the wood stove was in the back room off from the kitchen, and the teacher would help the boys keep the stove going. The school was white in color when she attended. She remembered cards being played there in the evening. She also explained how the children would do parades and she led them as the baton twirler down to the graveyard and back. The teacher at that time was Edna Palmer. Class sizes for different grades were small, maybe three people tops in one grade. The students/former classmates from her time were Glenda Ruel; Robert, Betty, and Richard Duel; Leona, Ina, Floyd, and Shirley Isham; Virginia (Ginny), Charles, Robert, Reginald, Lorraine, and Charlene Chambers; Pauline and Roland Ayers; Ronald and Joan Wellinger; Mavis, Larry, John, and Faith Pillsbury. There used to be a box social where the girls would make a lunch for two and put it into a decorated box, and the boys would bid on each not knowing which girl made which box. During the winter time mothers would take turns making a hot lunch for all the school children. Back then, mothers didn’t have cars, so some of the children would have to bring the food there in the morning on a sled and warm it up at lunch time. The teacher and the other girls would help with the warming up of the food and serving it. It was decided in 1961 that all the seventh and eighth graders would have a choice to go to Williston or Hinesburg School. Ina Isham is also a Lockwood descendent. She went to the school as a student and had siblings go there from 1938 to 1961. She also explained the schoolhouse was white. The kitchen had no running water, nor did the bathrooms. When you had to wash dishes or your hands, you had to lug water in and heat it on the oil burner cooking stove. In warm months you could get water from a spring out back, but in the winter someone would have to bring it or go to a nearby home and get what they needed. She cooked lunches in the winter for her entire seventh and eighth grade years. They started getting government food and got that in the winter only. There were kerosene lamps on the sidewalls going around the room for lighting, but they converted them to run on power. Electricity came to St George in about 1940. For fundraisers for the school, they held bingo and card parties. Holidays were a big part of the school’s program. The school children would put on plays, did poems, and sang songs with a piano that used to be there. The whole town would come and watch. The school children would also march to the graveyard with flags and flowers while Mr. Wellinger would play taps. The school children would also make scrapbooks for the veterans’ hospitals. The teacher would start the fire when she arrived and the school children would keep it going. A typical day would begin with the pledge and Lord’s Prayer. Songs were sung while the teacher or a student played the piano. In the winter they would keep their coats on and march around the room till the room warmed up. The school children would clean the school, wash dishes, and tidy things up. They had teeter-totters and a swing set in the yard as well as a white fence going around three sides of the property. They would even play baseball there. The teachers during this time were Ella Covey, Kathleen Phelps, Mary Hart, and Lucille Patrick. Ina also remembered she and her mom would go to the school house on the weekends during World War II where they made and stuffed mattresses on Saturdays. After the schoolhouse closed as a school, Ina was a Head Start teacher there until it finally closed in 1968. She explained that the marker above the door that everyone thinks is a date is actually the way the Chittenden South School District would mark that their schools met state standards in 1929. She also explained that the Hinesburg Fire Department came over and painted the schoolhouse red and the Head Start program finished painting the building. Ladies Home Dem would also use the space. Craft shows were held there, too. Kelly Winter was a teacher there from 1963 to 1965 when the school finally was closed. She loved teaching there. She said it was the best and first teaching job she ever had. There was running water at sinks by then as well as a running toilet instead of a natural composting toilet which most of the students used in their time. What Can We Do to Save This Building? I approached the town and asked what we could do. One thing we needed to do was approach CSSU (former school district #2) and see if they wanted the building and if we could do an assessment as we needed the owner’s approval. CSSU owned the building. 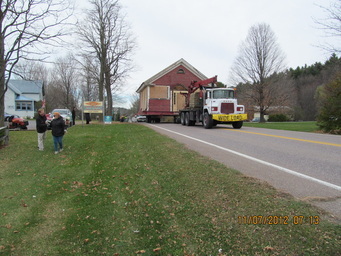 In speaking with them and having discussions with the school board, they decided the town could have the schoolhouse. As an historical society, we had an assessment done to see if this building was worth saving. Jeremiah Beach Parker Restoration & Construction Management Corporation came out and looked at the building. They gave us an estimate of $199,258.00 without relocation cost. So we felt it worth saving. We then shared this information with our select board members, and they said the town did not have the funds to take over this building. Then the select board said it would be best if the schoolhouse were taken over by a non-profit organization. The thanked us for solving the finding of the deed and dealing with all the issues around that. After we shared the mission statement of the non-profit we formed, they were happy and agreed to work with us in helping make this a reusable building for the town. So we formed a non-profit now known as Saint George Historical and Conservation Trust (SGH & CT) as well as set a mission statement. So now we are looking for people to write grants, to file paperwork with the IRS, people to be on our board, donations of time and, of course, money. This building is so untouched by time. Most one-room schoolhouses have been converted to other things. This is one of the few that has been untouched by time on the inside and outside. Many items remain in this building, and we hope that one day it will be used for events and town meetings again. When we cleaned up the building inside, we discovered a metal cabinet full of old books including several atlases. We even found the storm windows and many metal desks are inside. We had several former students show up to share their stories. We watched them cry, and they had lunch with us. What an amazing day that was. We had them all sign a guest list as they entered the old schoolhouse. Many couldn’t stop crying as they walked through and saw the old desks and books. During the winter of 2008-2009 the building took the weather hard, and the kitchen roof began caving in even though we had put a tarp over that area. As we were fixing the cave-in, we decided to look inside the roof area and discovered several old desks. They were hidden in there and were meant to be found as we tore down the building. We heard this story from a man by the name of Paul who said the teacher had him put them there in hopes someone would find them. We did a mailing to our town residents and got many members to join. We spoke with the development review board to make room for this building in the general plan of the town center. We even got the town to promise us a piece of land in the town center for this building’s final resting spot. The town also pledged $10,000 towards our efforts of restoring this building. I was surprised as things unfolded how things were missing and how some things were done back then. It’s from my interviews that I heard the students liked it there and all wanted to see this place saved and, of course, that it should be white as it was when it was used. We placed ads in local papers and asked people to call with a story or two, and they did. We heard from people as far away as Virginia. I have totally enjoyed this research and have gone beyond my research and brought people together on this issue. I am now a big part of making sure this does happen for this building. Hopefully, we are going to have students use some of this as a project for CVU grad challenge and get videotaped interviews to use as a history of the school. So many amazing stories and memories are still out there. I also discovered that former Senator Jean Ankeney was working on trying to do something for this building, so I feel I picked up where she left off and am going further. None of this would have been possible if I didn’t receive the (CCHS) grant to research this and bring the stories to life and to get the townspeople behind me. We all would like to see this as a great historical asset for the smallest town of St George, Vermont.